Ah, so that’s where you are, my precious….. Finally tracked our man Richard Black down. Not that I intend investigating him further. He was shown to be so fatally compromised that his resignation was only a matter of time. It was also obvious he is a radical environmentalist who was feeling shackled by the (minimal) boundaries the BBC were making him work within. Richard Black is on twitter as @enviroblack. Now I can see by reading his feed that other regular trackers, such as Mango Chutney and Barry Woods, were aware of this twitter account but I was not. Bit frustrating as it may have allowed me to harvest more details during my investigations. I do find it slightly odd he had two almost parallel accounts, one with his BBC username and the other more personal and started in late 2011. Perhaps he was planning to emerge from his chrysalis as long ago as last year? So what is our beloved Richard leaving the Beeb to do? According to Pallab Ghosh “He’s trying to save the worlds oceans”. With a twitter name like “EnviroBlack” it’s no wonder he has such grand ambitions. Perhaps he has a superhero special power he intends to use to fix the problem as he sees it. Former BBC energy, foreign, business reporter. Now at Greenpeace as editor of @energydeskUK. It is no wonder we do not have reporting balance in this country. Nobody reporting on environmental issues is impartial. On a personal note, this blog has now run its course. The environMENTAList machine spins on, hurricane Sandy fueling it, if nothing else. The world has been worked into a frenzied, mallable state now for the lunatics to take over the asylum. Richard Black may have gone, but there are a million other brainwashed disciples to take his place. Good luck in your fight. Mine is over for now. Was he pushed? Did my work to highlight his close relationship with activist groups help? So it appears Richard has chosen another path. Good luck to him and thankfully he can no longer poison the “impartial” BBC with his viewpoint. Surprised that Bishop Hill has not carried the news, very surprised indeed. Anthony Watts has released the news that has kept his blog Watts Up With That under radio slience for an unprecendented length of time. What is it all about? In a nutshell, the station siting classification used by Muller is bunk and so his conversion to the church of global warming hysteria is probably based on dodgy data and ideologically-motivated conclusions. NOAA is over-estimating warming across the continental USA by double the reality. Muller’s paper and conversion mean NOTHING. UPDATE: I’ve been advised by concerned friends that speculation on the nature of this announcement has gotten out of hand in the blogosphere, and that was not my intent. My intent was to give me time to work and something very important without the distraction of this blog, emails/twitter/facebook, etc. So. Nothing’s happened and anthony is not playing the game as people thought. Stand down people. Richard Black: So what is he actually doing in Rio? On 13/04/2011, 09:31:00, Emily Benson, created a document titled “Earth Summit 2012: Media Brainstorm and Activities“. This document appears to have pulled together all the ideas for media coverage from Stakeholder Forum at the RIO+20 conference. In it are a number of interesting entries. “More and more organisations are now producing their own audio content. These range from the UNFCCC Secretariat, to NGOs, to the BBC. Etc. They offer a diverse and often dynamic approach to a number of issues that are critical to the Earth Summit. We would like to collect many of these outputs into a single ‘Earth Radio’ channel where users can surf, pick and listen to a range of different programmes that tackle different areas of sustainability. Action: RB looking into the feasibility of this. The above is unquestionable evidence of a close relationship between Richard Black and advocacy group Stakeholder Forum. He has evidently been working closely with them and even ready to “pitch to the Beeb” on their behalf, thereby using our public money to help Stakeholder Forum with their propaganda aims for the RIO+20 conference. “Training: Develop a long term package to train up a team of young journalists from developing and developed countries around sustainable development/environmental reporting. This could complement some of the work already undertaken by the Media Partnership (IIED) who are focused exclusively on climate change and the UNFCCC process. Note how the BBC mentor is an environment correspondent, and how he will be paid the not unsubstantial sum of £4200. Not also how he will receive 14 days accomodation at £200 per day. Not a bad little earner is it? Who do we think that “environment correspondent” was? Join the dots between the brainstorming document and the budget document and you have your man: Richard Black. Clear evidence not only of Richard black working with Stakeholder Forum, but clear evidence of Richard Black working for Stakeholder Forum. BBC Royal Charter Agreement 2006. Again, I challenge the BBC to justify how Richard Black working for an advocacy group both before and during RIO+20 (surely he is mentoring those new journo’s while there?) can possibly allow him to remain impartial? UPDATE: “Sources I demand sources”. Here you go. Much was made of the amount of money donated to the Heartland Institute during the recent leak by Peter Gleick. The “climate realists” made much of the surprisingly small annual budget Heartland has – a projected $7.7 million for 2012. With one week to go until the attempt at a global coup d’etat, led by Felix Dodds’ shady umbrella organisation “Stakeholder Forum” at RIO+20, I thought it was time to release some figures I have received. What if I told you that Stakeholder Forum’s budget just for RIO itself is an astonishing 5, 356, 133. Now I am not sure if that is Dollars (US) or Pounds (UK) as the spreadsheet I have seen has no monetary symbols on it. I am convinced of it’s authenticity however, as it was created by “Hannah Stoddart” who is an employee of Stakeholder Forum. However, as Stakeholder Forum is mainly a UK entity, I am assuming the budget is in Pounds Sterling. This makes their Rio budget a massive $8,321,938.02, MORE THAN THE ENTIRE PROJECTED BUDGET FOR THE HEARTLAND INSTITUTE IN 2012. Big Oil, what a joke. Below is a screen shot of the financial overview. As you can see from a bit of the detail in the screenshot below, Stakeholder Forum are spending an amazing £68,400 on PODCASTS along for the RIO+20 conference. That is some serious social media propaganda. Remember the fuss made because Heartland were thinking of giving Anthony Watt’s $88,000 to set-up a website for the surfacestations project? Well, let’s see what Stakerholder Forum have spent on their website for RIO…. That is correct, your eyes are not deceiving you. A total of £130,000 ($201,965.91) has been allocated to their RIO website over three years. Remember, this is the budget for RIO ALONE. This is NOT Stakeholder Forum’s annual warchest. Put’s the “realists” bleating about big oil into perspective doesn’t it? Now, where does the BBC and Richard Black fit into this information? Ah, well that is coming in part two. Let’s just say that Richard is doing a bit more at RIO than covering it for the BBC and will be earning a tidy sum on top of his BBC salary. I had the dubious pleasure of sitting at home yesterday. Indoors you understand, due to the 17th straight day of rainfall, with yesterday’s being the most persistent yet. Even today, it has rained heavily for four of the past 7 hours. Yet, I saw several times on BBC News 24 some BBC journo standing by a reservoir, in the rain just for some added irony, telling me that a bit of heavy rain would not mend the damage of “several very dry years”. Then we had a rent-an-eco-nut from the Met Office telling the camera how dry it was. Then we had someone from Anglian Water telling us how they do all they can, but it is just very dry right now. This nonsense was repeated on the Main BBC 6.30pm news as well. I think the poor hack had been standing in the rain all day at this reservoir. He stood by a big lump of old wood and claimed the water is “usually” up to here (about 6 feet above where he was standing. So let’s look at some simple facts. Now that data only goes up to 2010, but look at the pink trend line. Level. Flat. Look carefully at the graph. Then ask yourself, if this is such a mega-bad drought, how on earth did we survive between 1955 and 1995 when it was consistently lower than it has been since 1995. In fact, look at the rainfall from 1995 – 2010. We have had a LOT of rainfall. So what about 2011, the “missing link” that the BBC, MET and ANGLIAN WATER all claim was “exceptionally dry” and a lack of rainfall that would “become more frequent due to climate change” (odd how we are also told it will get warmed and wetter …)? 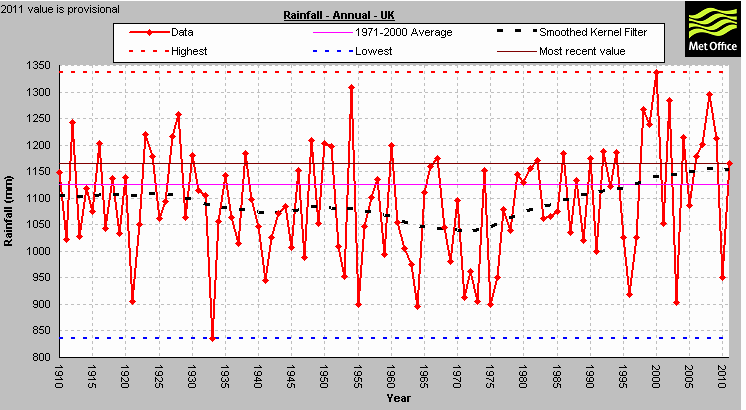 Well, it was actually only “exceptionally dry” in the south east, where rainfall levels did dip to as little as 13% of average (1979-2000 average) for a short period in East Anglia. But what was the truth of 2011? 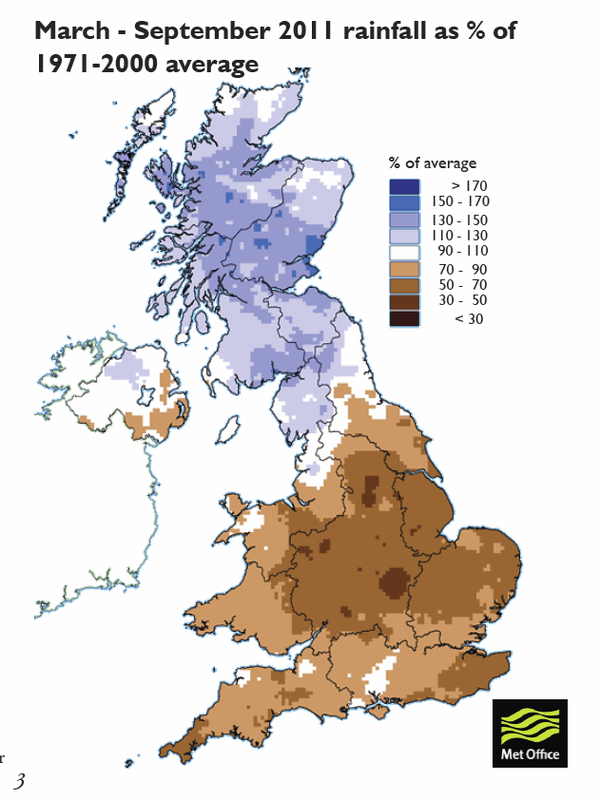 As you can see, despite what we were told, the rainfall levels for most of 2011 were actually 50-70% of normal in England and Wales and in many areas up to 90%. That is a lot different to “unprecedented low rainfall” as quoted by the MET. The Alarmist MET, the Alarmist BBC, the Shareholder-Driven Water Companies….. Compare the 2011 October line with the Minimum October data and the years of that minimum. Are we in a drought that the current rain “will not ease”? Are the reservoirs at the implied unprecendented low levels we are led to believe by the daily propaganda update from the BBC? Look at Thames water – London and Farmoor. 80% full, 93% full last October. 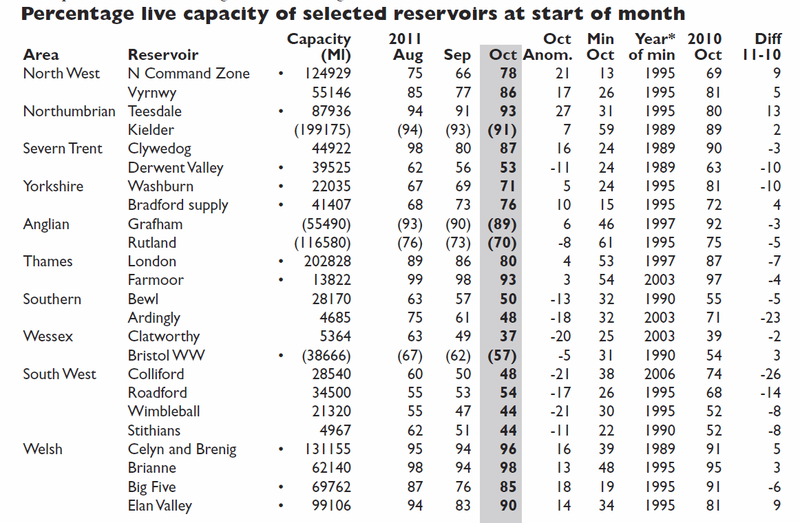 So, despite the unprecedented drought in the South East, despite the ever increasing population squandering this precious and dwindling (so we are told daily) resource, reservoir levels in our most densly-populated and driest region, went UP 7% to FULL between October 2011 and March 2012. Yes I know, cherry picking! Nasty, ‘orrible cherry picker of data that fits my message. Ok, so what about Rutland reservoir. That sits right in the middle of the burnt, brown, desert that is Englands drought zone. 77%. My god, turn off your hosepipes. Stop washing your dirty little personal crevices. Let your children run the streets in filthy clothes. In no human beings universe can that glass be half empty. It’s actually 77% full. Thank you commenter “MostlyHarmless” for pointing out my schoolboy typing errors. I did of course mean to say that the pink line was the average and meant to say that the black line is the trend and it actually goes up.